Jonathan Sacks is an outstanding intellectual of our time. Unlike many others, he also writes in an accessible way. Here, he has written a very profound and philosophical book that is extremely readable. One of Jonathan Sacks' major concerns is that religion is one of the principal causes of dissent, hatred and violence in the world, and he wishes the Jewish religion to make its contribution towards healing the deep wounds that this creates. 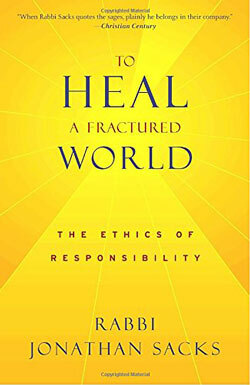 One of Judaism's most distinctive and challenging ideas is its ethics of responsibility. We have been given the gift of freedom and we in turn have to honour and enhance the freedom of others. More than in any previous generation, we have come to see the individual as the sole source of meaning. We have become lonely selves in search of purely personal fulfilment. This argues the author is a mistake, for ethics are conveened with the life we live together and the goods we share- that only exist by virtue of being shared. The Chief Rabbi argues his case in a way which shows a profound engagement with the human condition today and a reflection of how widely he has read. He talks with as much authority about the Old Testament as he does about Maimonides, Sigmund Freud or Hannah Arendt, and his views on Israel are as distinctive as ever. This book is written to be studied carefully by members of the Chief Rabbi's own community. But it is also a clarion call to the outside world to come to its senses.